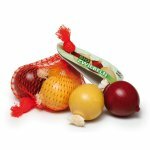 BabyNaturopathics.com - Erzi Sack of Onions Wooden Pretend Food - Baby Naturopathics Inc.
Three�onions are packaged in�a red plastic net bag. The onions are similar in size to real-life shallots.�The onions�are made of hardwood and colored with safe, waterbased dyes. Erzi�Sack of�Onions is made in Germany.